What a beautiful day today!! I managed to get a lot of housework done, gardening and even had a little time to do some crafting this evening. I made this cute shaped ice cream cone card using the Simply Charmed cartridge. I used my gypsy girl to weld the cones together. I cut it at 4.88 x 8.39 plus the layers. I embossed the bottom of the cone with the sizzix diamond folder.The cute little face was stamped using the PK~Wide Eyed Kids. I added some ribbon and stickles to add a little sparkle to the cone. I also am entering this over at a challenge at CAS-ual Fridays Challenge #10~Clean and Simple "Shaped" card and Paper Cutz Challenge #99~image of ice cream cone, popsicle, ice cream sundae or milk shake. Tropic Krafts . Since this award has no rules... 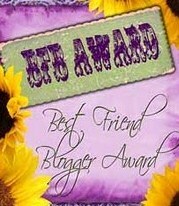 I would love to share this award with all my blogger friends. Please accept this award!! The rules for this award is that I have to share 5 things about myself with you and then pass it along to 5 bloggers. YUMMY LOVE THE LOOKS OF THIS CARD MAKES ME WANT ICE CREAM. Ok...you are very good. That is a stinkin' cute card. I love that ice cream cone. So cute,love the embossed cone.TFS. Oh My Goodness what a yummy/adorable looking card. Congrats on your awards. Adorable! I love gingham scoop!! Glad you joined the fun at CAS-ual Fridays! I love this little ice cream card, that face is too cute!!!! Congrats on the award, well deserved!! Such a spectacular card!!! Love it!!! I especially love that cute lil face!!! 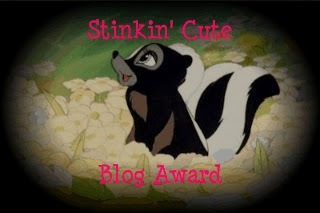 Congrats on the blog awards!!!! WooHooo!!!! Cute card Sherrie!! Don`t you just love how a PK face can transform something simple into something ADORABLE!! PS - Did you know this card also fits into the newest challenge on the PK blog - it`s PK faces and patterned paper! Just thought I would let you know in case you didn`t already! Delicious!! Tons of dimension and interest - what a sweet, sweet expression on her face, too!! Thanks so much for playing with us at CAS-ual Fridays! !